The Luftwaffe’s Messerschmitt Bf109 single-seat fighter was the main combat adversary of the RAF’s Hurricane and Spitfire fighters in the Battle of Britain. It could climb and dive faster than the RAF fighters and its competitive edge in combat was helped by its direct injection fuel system. Its formidable performance and potent armament made the Bf109, arguably, the best fighter of the Battle. This book covers the history of the ‘109, restoration to flight, views of owners, pilots and engineers, operating and servicing. There are data boxes covering ‘109 facts and figures, and interviews with owners and pilots. Photographs and illustrations are drawn from a variety of sources, including Luftwaffe official wartime manuals, official and private archives, restoration projects in the UK and overseas. Paul Blackah joined the RAF in 1976 and trained as an airframe fitter. In 1993 he was posted to the Battle of Britain Memorial Flight. His specialized knowledge of vintage aircraft is considered crucial to the maintenance of the aircraft in the flight. 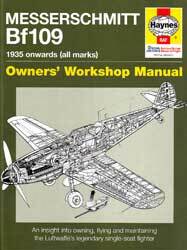 In the 1990s Paul was closely involved in the restoration to flight of the Messerschmitt Bf109F ‘Black 6’. He is co-author with Alfred Price of the Supermarine Spitfire Manual. He lives in Lincolnshire, England. 160 pages, 10 x 8, softbound, photos.